Wohl Frankreich. Eisenguss (Vase) und Steinguss (Sockel). Je 2-tlg. Rechteckige Sockel. Vasen mit quadratischer Plinthe, konischem Rundfuß und kelchförmigem Korpus. Altersbedingter Zustand. Witterungsspuren. H. 79, B. 53, T. 53 cm (Vase) H. 60, B. 46, T. 46 cm (Sockel). Provenienz: Prinzessin Gloria-Victoria von Sachsen-Coburg und Gotha, Herzogin zu Sachsen, Schloss Gosheim. 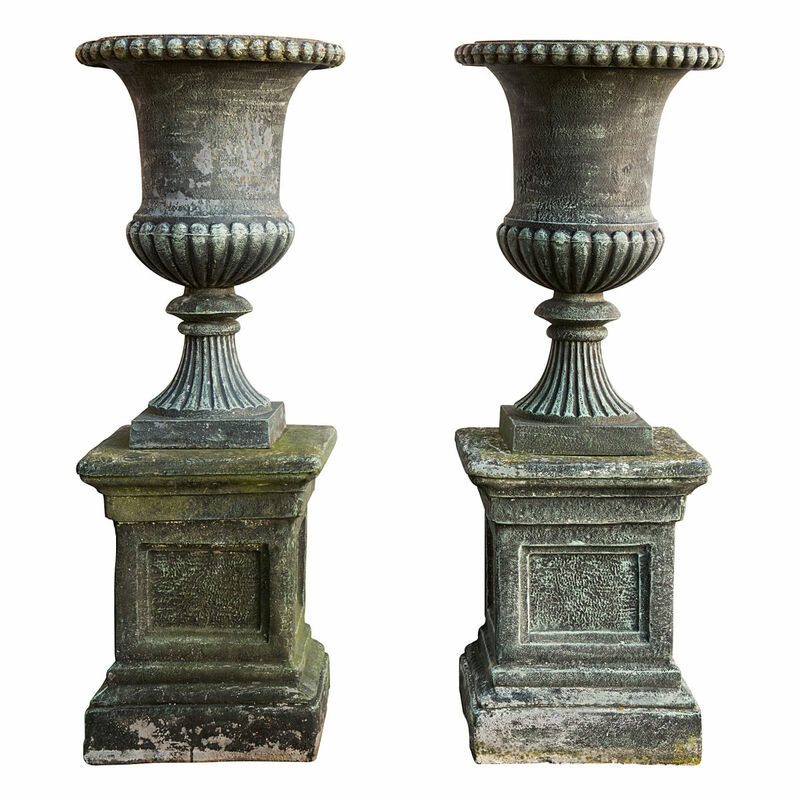 Pair of Medici vases on bases with bead and reel decoration. Probably France. Cast iron (vase) and cast stone (base). Two pieces each. Rectangular bases. Vases with square plinth, conical round base and cup-shaped corpus. Age-related condition. Weathering. H 79, W 53, D 53 cm (vase), H 60, W 46, D 46 cm (base). Provenance: Princess Gloria-Victoria von Sachsen-Coburg und Gotha, duchess of Saxony, castle Gosheim.